Do or dew? Its or it's? 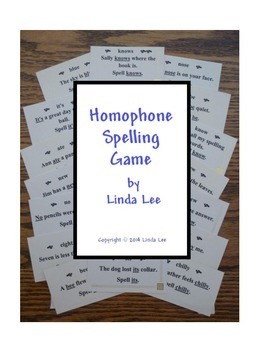 Here is an easy way for 4th and 5th grade students to review the correct spelling of homophones. This card game has four decks of cards with 50 cards each. Two students compete to spell the most homophones correctly in sentence context. 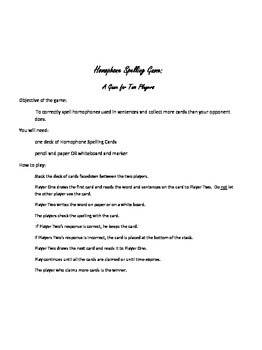 *Homophone Spelling Game Directions which includes the Teacher's Page (objectives, how to prepare the game cards, and directions for play), a list of the 200 words used in this unit, directions for students, and photos of the cards. 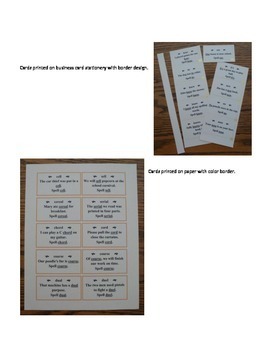 *PDF files for each deck of cards which can be printed with or without borders. Download the preview to see directions and sample cards.